This is box five of a six month subscription to Glossybox. For those of you not aware of the concept, Glossybox is a monthly beauty subscription box containing 5 hand picked beauty samples wrapped in a signature pink box. Some of these samples may actually be full size products. This month Glossybox is all about “revelling in festival season or hitting a sun-drenched beach” and contains “exclusively designed faux tattoos… to the quick fixes that keep the skin fresh and flawless in the heat”. To be honest this box looks like an idea which made sense when it was conceived but falls a bit flat in the execution. For a start, how many of us actually go to a festival? And the last time I wore a temporary tattoo I was about Caitlin’s age. The mix of products is a little odd too, even though there are three full size products in this month’s box (although one of these is a sheet of tattoos). In amongst the nail varnish and facial mist are an anticellulite boost and a packet of facial wipes. The box contains 3 full sized products worth £22.76 together and two sample products, one of which is £1.20 and the value of the other not listed. The cost of each box is £10 plus packaging (£3.25), so, again, I have received more than I paid for. 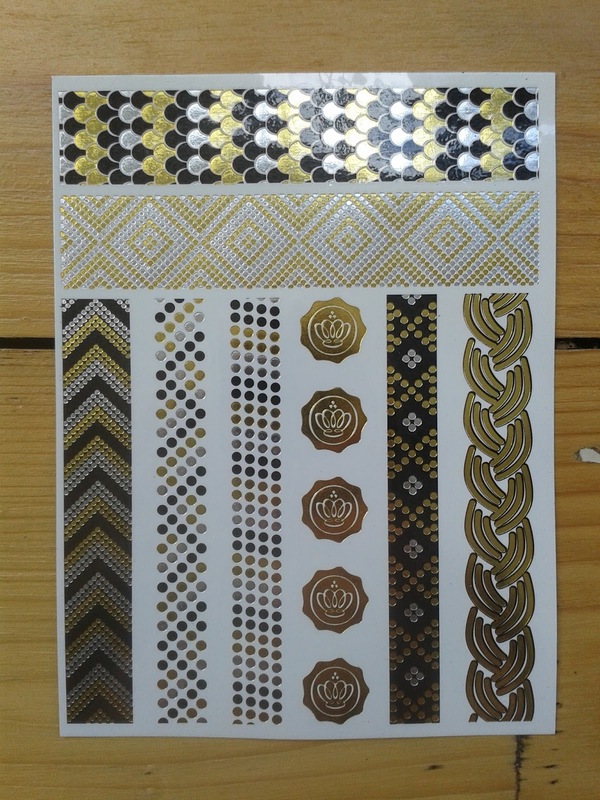 The first full size product in the box is a sheet of Glossybox’s Flash Tattoos (£6.50). There are 12 tattoos and frankly I’m not sure the sheet is worth the rather notional price Glossybox has given it. 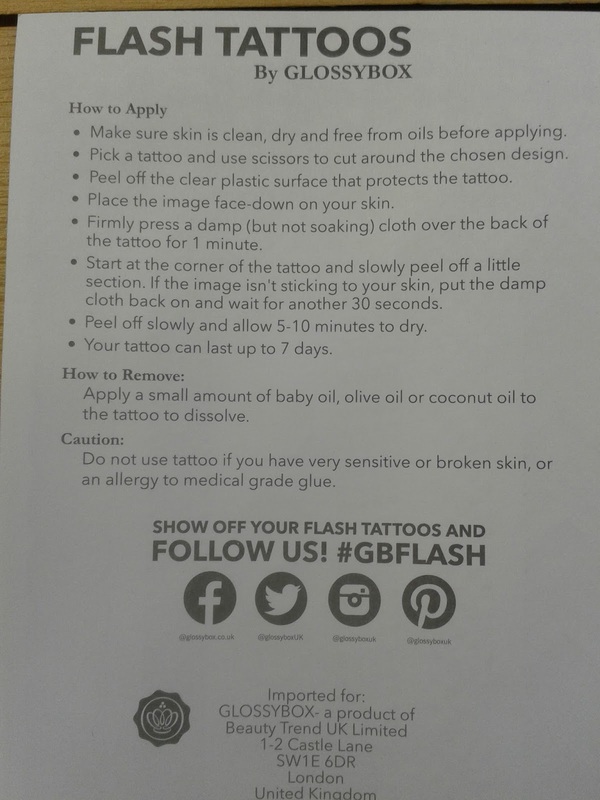 Application is by damp cloth and the tattoos will apparently last a week. I might try one later to convince the Husband I’ve had a moment of madness whilst out shopping but they hardly look convincing. Rather more Art Deco book binding than festival tattoo craziness I’m thinking. 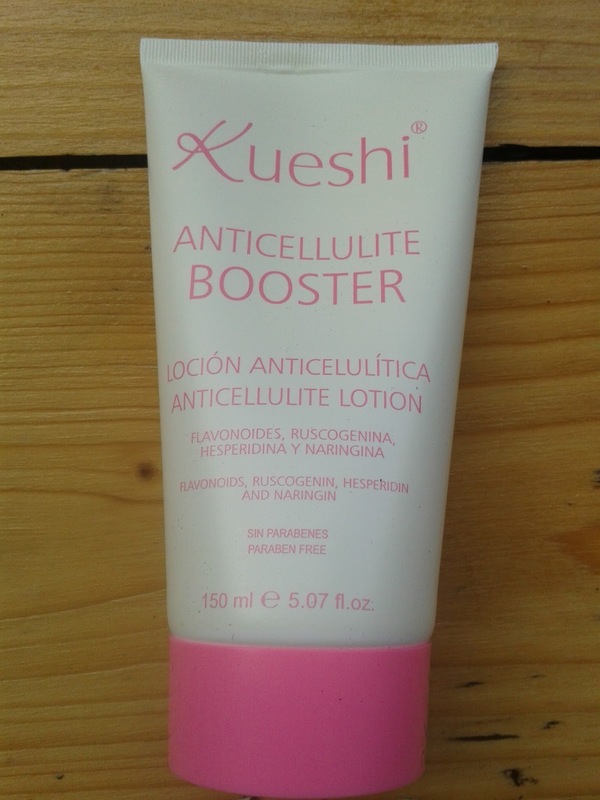 The second full size product is the Anticellulite Booster from Spanish company Kueshi (£14.55) which is a lightweight cream with “a hard hitting mix of natural ingredients and antioxidants to stimulate blood circulation, in turn toning your skin and fighting off any dimples. I don’t actually have any cellulite but the cream is pleasant enough, although somewhat sticky. The natural ingredients include Astralagus, Butchers Broom, Lemon Peel and Goldenrod Flowers. The website www.kueshi.com is pretty spartan and I can find no obvious way of purchasing the product which is a little odd. 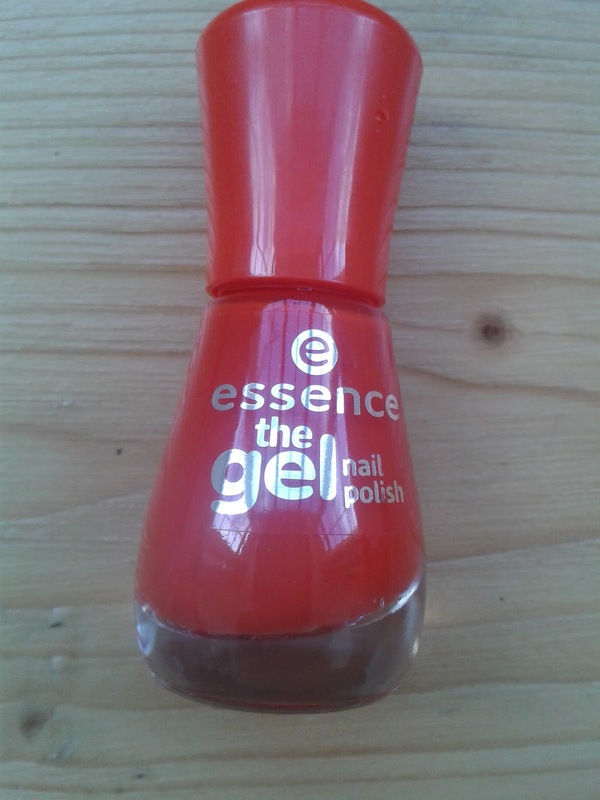 The final full size product is a “The Gel Nail Polish” in “I Don’t Care” from Essence (£1.71). You don’t need a lamp but you do need a base coat and a top coat so supplying one out of the three products needed to test the product doesn’t make sense to me. I also find it hard to get excited about a product that costs the princely total of £1.71. The polish is described as “having a long-lasting gel formula for an amazingly shiny manicure that endures all week”. More information is available at www.essence.eu/uk and the products seem to be ready to buy from your local branch of Wilko. 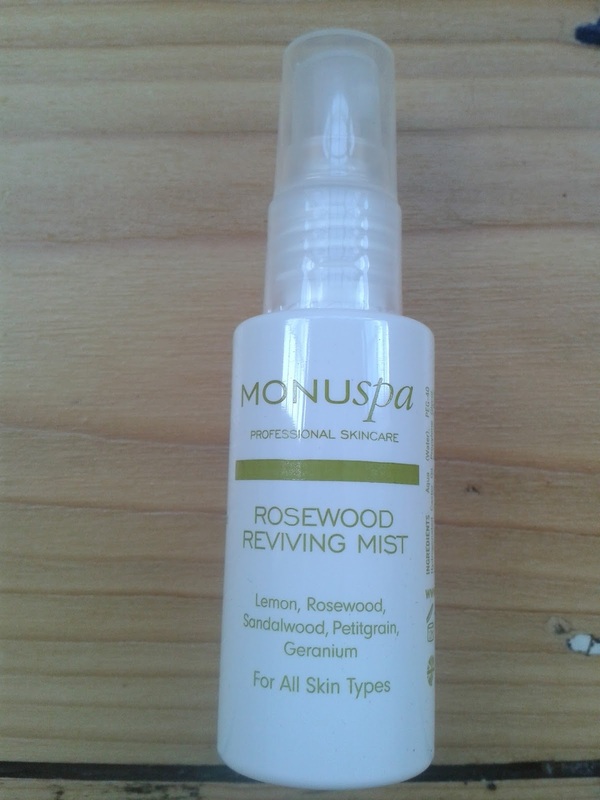 The first sample product is Monu Spa’s Rosewood Reviving Mist (full size £11.95) which contains a ‘zesty blend of essential oils including lemon, rosewood and geranium’ which you mist over your face to refresh and set make-up. You could also spray all over to hydrate skin after a bath, shower or swim (which seems like a very expensive way to use the product to me). Readers of this blog know I’m not a fan of facial mists (I really can’t see the point) but this one smells pleasant enough, although I can find no mention of whether it is suitable for sensitive skins and, just because it contains essential oils, does not mean it is necessarily that gentle. 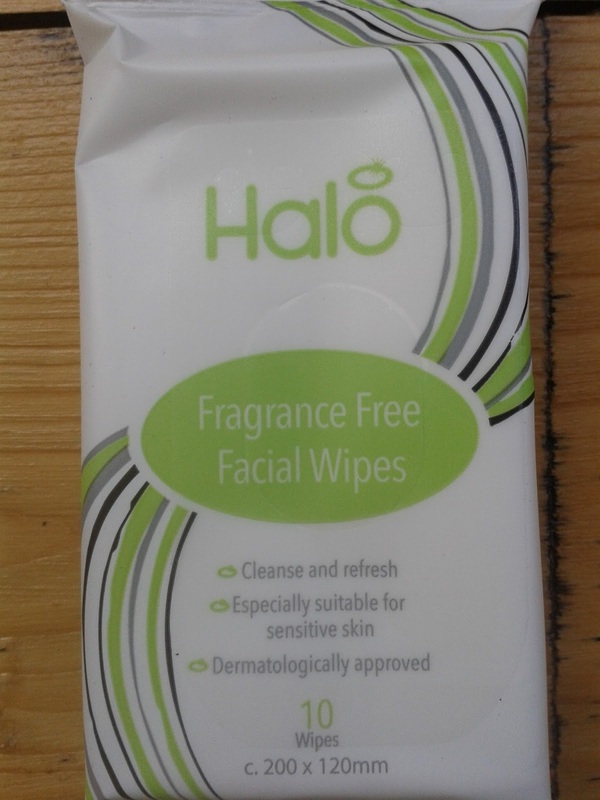 The last of this month’s treats is a sample size of Halo Fragrance Free Facial Wipes (10 wipes, suitable for sensitive skin) which have gone straight into my handbag for emergencies. 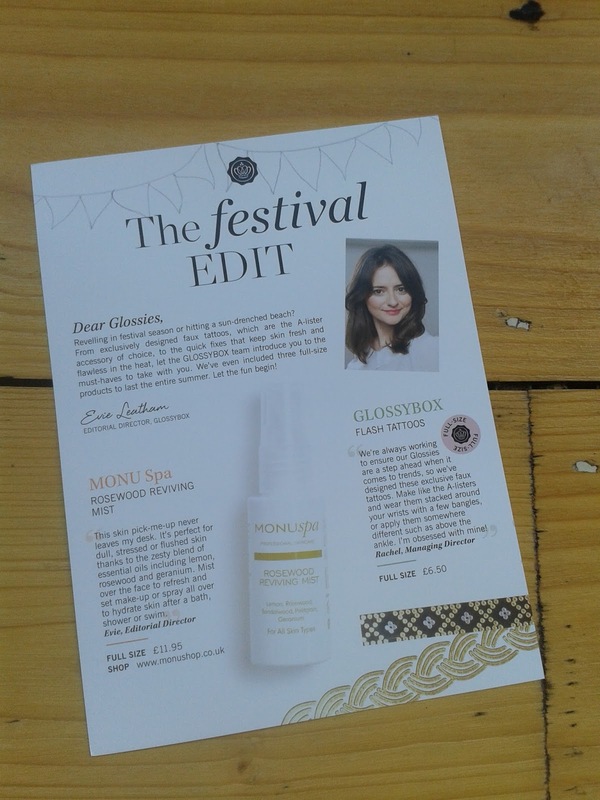 I have heard of Halo and I can see the logic of their inclusion in the “Festival Edit” but I’m not sure it fits into the overall Glossybox ethos of introducing new and slightly higher end or different beauty brands. So there you have it. The “Festival Edit”. To be honest I’m not sure the rest of us are as in love with “festival experience chic” as the glossy magazine editors seem to be. My own ‘edit’ would have included antibacterial hand-gel, a plastic rainhood and some paracetemol. Best not let me loose on editing the next box then, although I might also have included some chocolate. Am I happy? This is definitely not the best box I have had but I can’t quibble about the value of the products. I have one more box in my 6 month subscription to go in July (with a promised French theme) after which I will be deciding whether to stick with Glossybox or, as is more likely, to try one of the many other beauty boxes out there. I’d love to know which ones you think I should try. Or are you a die-hard fan of Glossybox? 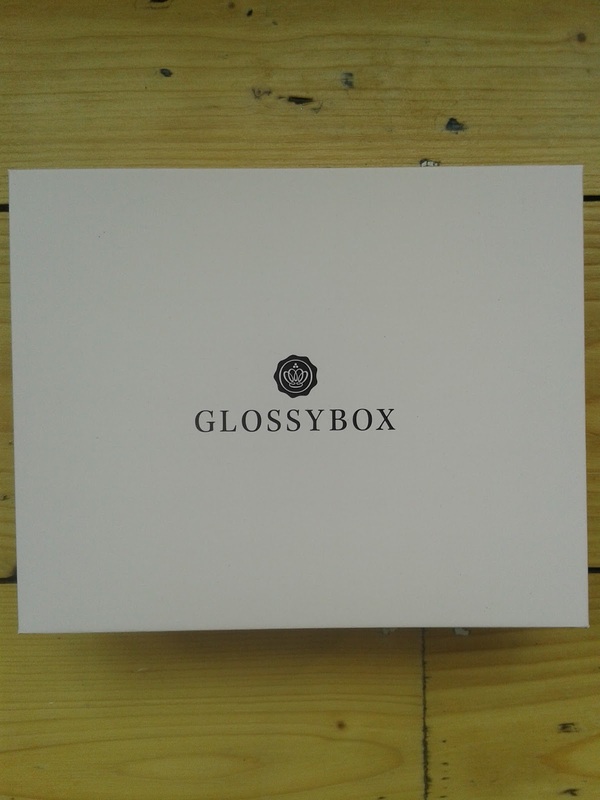 Disclosure: This is a completely independent review; The Glossybox subscription is my own purchase. Glossybox can be contacted at www.glossybox.co.uk, on Twitter at @glossyboxuk and on Facebook as www.facebook.com/GlossyBox.co.uk. "Dad & Me & Dear Dad – Beautiful Journals For A Father’s Day Gift"
"Review: Wassen Collagen Drink For Radiant Looking Skin"